Apostolic Titbits: Is that you God? I want to share a important information that I believe will bless us all who are many times asking this question "Is that you God?" as we hear and see the various coincidences that lifts up our spirit through out our trials we face within and without. Recently dad who is serving the Lord has been found out with some bad cholestrol that was not going down for nearly the last five or six months, actually he has always been healthy and weighed the same for the last 30 to 40 years. That is just actually amazing and is the grace of God. But doctors advised him to go and do an angiogram which is like a detailed check up in to the heart through letting a camera through the nerves right in to the heart. Dad was in good spirit, but some how as a trial he got cold just before the test and dad felt so bad when they conducted the test for more than an hour and half inside an air-conditioned testing theatre. While he came out of the test he was shivering due to the cold chill he felt through out his body, was feeling thirsty extremely due to anasthesia to the extent he told me that he thought it was the end and also had a very high temperature. There we are me and my brother, dad prayed for Himself and then told both of us to pray for him even as the nurses tried to provide more woolen blankets to him. As I prayed with tears in my eyes, by the authority of the Lord upon me I pronounced that God is dispatching a host of angels to touch him and be all around him. As I pronounced the word of the Lord over him which I heard in my spirit, then my Elder Brother prayerd for a while. Hardly ten minutes passed as I was believing what the Lord had told me, completely the whole thing got subsided. I began to praise the Lord for His deliverance! But then the doctors diagnosis was that Dad should go in for a Bypass operation as he is having some three to four blocks in his heart at critical places with emergency needs. Then as I was sitting near his bed, suddenly he remembered the previous operation for Hernia nearly 5 years ago in which as he was seeking the Lord on the night before the operation went on. Then he told me that on that night he had seen a vision which gave him the strength to go for the operation with faith. He told me that in the vision he was sleeping in that private ward, suddenly he felt that in the night as though the front door to that room was not bolted but was open. He thought of closing it in the vision, before he could do it he felt that somebody was standing behind the door and was trying to come in. Then he was only able to see a glorious shining light come out of the door that was being opened and suddenly out of that light he heard a glorious voice that said to him, read "Ps 121". Suddenly he realised that it was only a vision and it was nearly 2 hours past midnight. Immediately he took his Bible which he always keeps near the bedside and began to read it. 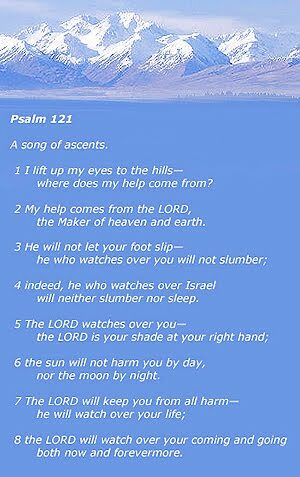 In it was written my dad's name "Indeed, He who watches over Israel neighter slumbers nor sleeps." (Psa 121:4). And in the morning while I saw him before the operation he was joyful and full of faith. And then slowly he told me about the assurance that God has given to him that past night. The operation went on well by the grace of God and he began to serve the Lord better than before. Praise the Lord! I don't know why he did this, but repeated this vision to me who was sitting by his bed side after we slowly conveyed to him about the doctor's diagnosis. As I was thinking about it for a while, we received calls from different men and women of God for the next hours. As they began to pray, I literally heard them say this same Ps 121 in their prayers at least in part and reference. I told my mom and she was surprised to hear how God was reminding us about His promise. Then some four days later, a beloved believer fasted for Dad's health and sent me an sms saying, read "Ps 121": the promise I got from God regarding dad's health. Again I told my mom and we rejoiced of how God reminds us of His promsie again. Do we call it coincidences or should we ask God, "Is that you God?". The world may call it coincidences because it does not know the God who cares His children who go through trials and sufferings, but as for us we should praise God for the ways in which He speaks and gives us assurance of how he watches and cares for us individually in the moments of our lives greatest crisis. Surely our God who watches over us, finally delivers us from those evil tidings that has come from the wicked one (Ps 34:19). Praise the Lord!